The many obituaries of the American politician George McGovern published in the aftermath of his death last Sunday mention that he earned a PhD in History from Northwestern University. But other than that they offer precious few details about George McGovern’s life as a historian and scholar. My colleague Jonathan Rees at Colorado State University-Pueblo fills the gap with an appreciation of McGovern’s historical work (“George McGovern: Historian”) posted yesterday to the Historical Society Blog. McGovern’s 1972 book The Great Coalfield War (co-authored with Leonard Guttridge and published in the year of McGovern’s candidacy for president of the United States) is a seminal text for understanding the 1913-14 southern Colorado coal miner’s strike. 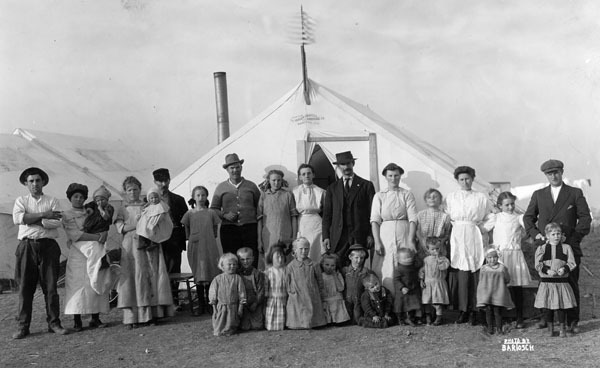 This 15 month-long strike culminated in perhaps the most dramatic example of open class warfare in American history, the infamous Ludlow Massacre. Between 1997-2007 I researched the Colorado coalfield strike as Co-Director (with my fellow anthropologists Phil Duke and Randy McGuire) of The Colorado Coal Field War Project. This project was generously supported by grants from the Colorado State Historical Fund. 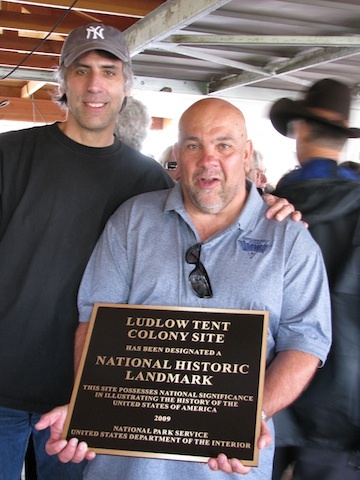 It included the first-ever archaeological investigation of the most important of the miner’s strike camps, the Ludlow Tent Colony or, as it’s described by some locals in southeastern Colorado, the Ludlow “Tent City.” Ludlow was the largest of a dozen such strikers’ camps. It was strategically located on windswept prairie at the mouth of a canyon that led up to the coal mines. Ludlow consisted of about 200 tents and housed around 1200 people. Our archaeological work produced several key insights about striker life at the colony: how the occupants organized their built environment, how they provisioned themselves, and how they survived one of the worst winters in Colorado history. Several of our research findings are relevant to the concerns of this blog. 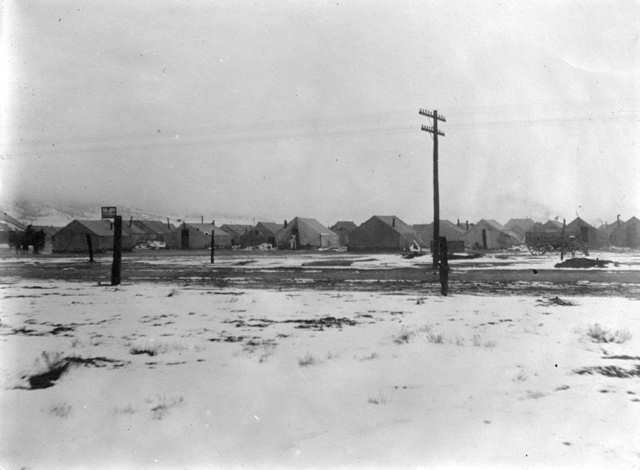 In keeping with the commitments of an “Intercultural City” there was no apparent ethnic segregation of families within the colony (24 different languages—mostly eastern and southern European—were spoken in the southern Colorado coal camps and mine shafts). Based on the stratigraphic positioning of artifacts within cellars dug beneath the tents it appears that colony residents attempted to forge solidarity through the everyday use of certain shared items of material culture. For example, use of plainware ceramics seems to have been preferred over finely decorated Victorian teawares, as the latter would have signaled different social statuses and/or social-climbing ambitions. In other words, strikers sought in their daily practices to emphasize a shared working class identity. The tents were arranged to maximize security and impede surveillance of the interior by passers-by, especially coal company officials and professional strikebreakers. A concerted effort was made to present a “civilized” face to the outside world as a way to combat early 20th century racist stereotypes about immigrants as unclean, ignorant, and naturally violent. 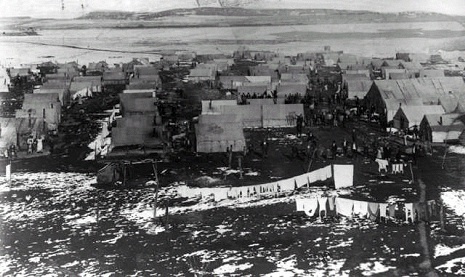 The tent city as portrayed in historical documents and photographs evince concerns for health, cleanliness, family, community, and civic order. Our archaeological excavations also suggest that contemporary state militia reports may have purposely over-estimated the amount of weapons and ammo–the number of WMDs, if you will–possessed by the strikers as a way to exaggerate the threat that they posed to public safety and, by extension, justify the militia’s assault on the colony on April 20, 1914. In short, our archaeological work supplements, enriches, and even corrects the established historical record of the strike. Like Jonathan, I had a personal encounter with George McGovern at the April 2004 fundraiser for the Bessemer Historical Society. After the event Phil Duke and I ferried the Senator back to his hotel along with our significant others. The five of us had drinks in the lobby lounge. We talked a bit about Ludlow. But mostly we talked about the 1972 presidential campaign. As Jonathan notes, it was hard to stay away from that topic and, like Jonathan, we were treated to some of the Senator’s favorite reflections about his opponent (“I would rather be me right now than Richard Nixon“; and “Nixon was incredibly intelligent, but completely amoral”). The Senator was accommodating and gracious throughout the evening. 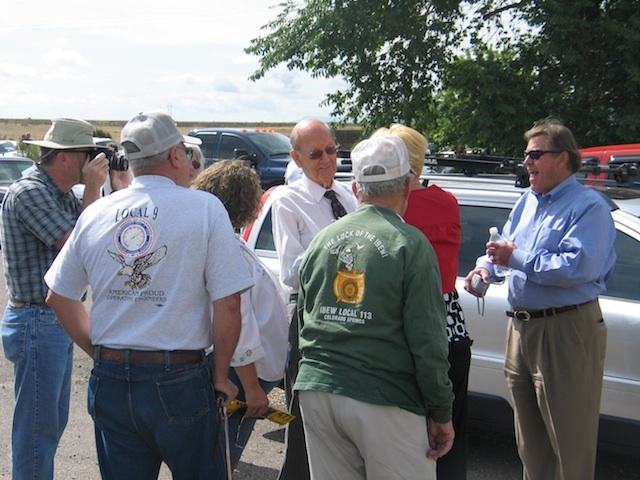 In 2008 I again met up with Senator McGovern when he visited the Ludlow Tent Colony site to speak at the United Mine Workers of America (UMWA) annual June memorial service remembering victims of the Ludlow Massacre. That day I had the honor of batting lead-off for a line-up of speakers that included Senator McGovern and the fiery United Mine Workers of America president Cecil Roberts. The June memorial service is never for the faint of heart, and it was especially energized with McGovern and Roberts in the house. Cecil can wave the union flag and excite a crowd like no one else. But McGovern was no slouch. I recall the Senator giving us a taste of what Jonathan, in his Historical Society Blog post, describes as the “barely concealed anger and pro-union language” of McGovern’s original dissertation about the southern Colorado coalfield troubles. The dissertation served as the basis for The Great Coalfield War, but was sanitized in 1972 for a polite election year readership. Senator McGovern’s historical scholarship is significant because it paved the way for more recent Ludlow histories (e.g., the books by Scott Martelle and Thomas Andrews) and historical archaeologies (e.g., my book and a collection of essays edited by Karin Larkin and Randy McGuire). The 2009 listing of the Ludlow Tent Colony as a National Historic Landmark testifies to the quality of this accumulated scholarship and McGovern’s original pathbreaking text. Many plays, films, poems, and novels about the Colorado Coal Field Strike have been similarly inspired by McGovern’s scholarship. This creative work is just as important as traditional scholarship for communicating the lessons of history, sensitizing us to human difference, expanding the scope of who counts as part of “us”, and furthering moral progress. While driving home yesterday I heard a National Public Radio piece about Senator McGovern’s death that included a clip in which he said that “I’ll go to my grave believing America would be better off had I been elected.” I suspect that’s true, but we’ll never really know for sure. Certainly, we can be much more confident that the practices of social history and public history are far better off—more inclusive, more democratic, more humane—because of the work of George McGovern: politician, historian, scholar, gentleman. Thank you so much for this post. I knew McGovern well, serving in his presidential campaign for 18 months, and in his Senate office for a year after that. What a great man, with wonderful values.